Four years ago I became a stay-at-home-Mom-with-kids-at-school-all-day. And for the first time since pregnancy I remembered what it was like to be alone. 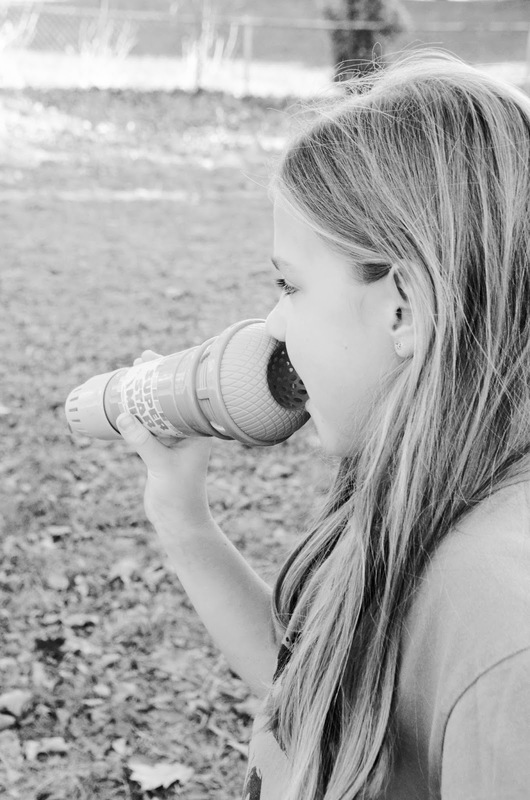 Once the hustle and bustle of getting kids off to school and through the car pool line was done I breathed in the silence and celebrated the fact that I could now have a complete thought in my head. It was not easy at first, actually. 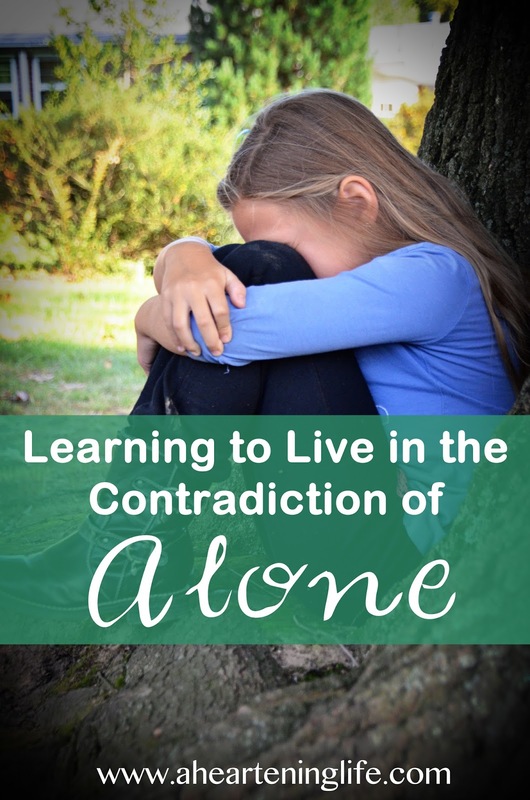 I struggled those first few weeks (or maybe even months) with this new found aloneness. I was used to having a toddler partner accompany me to errands and to enjoy lunch dates with. Alone became such a contradiction — something I desired, but despised. And I wondered why I wasn't very good at it? I have since realized that alone is a comfortable place when one is comfortable with themselves. So the past four years have been a training ground for me to make peace with the silence and relish in the freedom of deciding my own day. But there is another side to alone. One far more isolating and sinister. I have been trapped in the snares of alone and the lies it breeds. Lies that convince you everyone else is having a grand time without you. 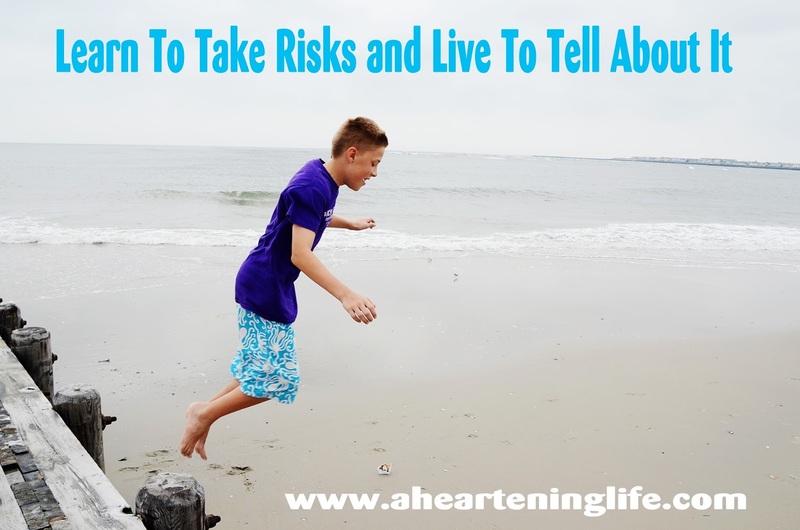 Deceitful tales that have you thinking you are the only one who has ever struggled, doubted, or been afraid. In the silence of alone your thoughts take advantage of their audience with you and sweep you away to write stories that lead you to darkness. You aren't alone. That is the point, after all. If you have ever been brave enough to share your story you soon see how connected we all are. How easy it is to find an empathetic soul in this world who knows just where you are or where you have been. I remember a time when I fell for the lie that I was the only one. And Truth slipped into my heart from a pastor's lips reminding me there was One Man who experienced it all. Who knew my pain. Who experienced the array of feelings I had felt. And comfort rained down on me that day. Alone doesn't thrive in community. But you must be willing to risk and share the deepest parts of you. Because that is where you will find comfort in being known. That is where you will meet others who understand. We all live in the contradiction of alone — where there is beauty in the quiet and rest for the weary. Where being alone can be a healthy lesson in being content hanging out with yourself. But alone can also become an escape, an excuse to live like an island. And without the input of others, the harder it is to discern the lies from the truth. "Islands are great to visit. But I have found we aren't meant to live apart." Christa Wells, "More Than I Am"
It's good to live in the balance knowing that taking time to be alone is a necessary choice sometimes, but the gift of friendship and community are ready and waiting for you when you want it. I have been working on building a sturdy fence for several months now. And it's a lot harder than I thought it would be. Boundary setting is definitely a process. You cannot just start randomly weaving posts and rails because you think you need them. They need to line up — which only happens when you understand more about yourself. I'm working to reinforce my weak and wobbly fence, which helps most of the time. But I will never have a perfect, invincible fence no matter how hard I try. 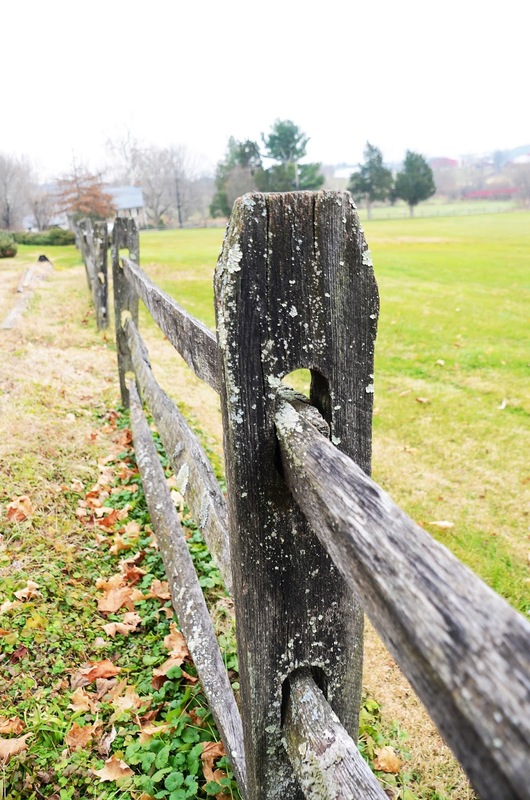 I have noticed some huge gaps between fence posts — an invitation to walk right in. No fence. No gate. No boundary. I think it's because boundary setting is such a risk for me. I potentially have so much to lose. And that scares me. I know I need a fence so I start building one, but there are people I know too well. Patterns that are familiar. Enabling others to come and go in the name of what I think is empathy. Or maybe it's just guilt. The all too familiar voice convinces me I'm not allowed to set a boundary there. Or manipulates me into thinking I'm not being loving or kind or compassionate if I build a fence in that spot. Boundaries take courage and surrender. I cannot fear what someone else's reaction to the boundary will be. Because the boundary isn't about other people, they are about me. It feels so complicated sometimes. For me, boundary setting is a big #RiskRejection. I set some boundaries this week with someone very close to me. And it was so hard. Excruciating actually. And as soon as the words came out of my mouth I started to self-doubt. I felt bad, so I started to question myself. Tried to figure out how I could maybe only build half a fence or maybe the gap there was okay after all. I have to learn how to sit in this place — where people aren't necessarily going to like my boundaries. 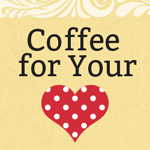 Because boundaries change me from people-pleasing yes woman to someone new. Someone I'm still trying to figure out. Still trying to find. 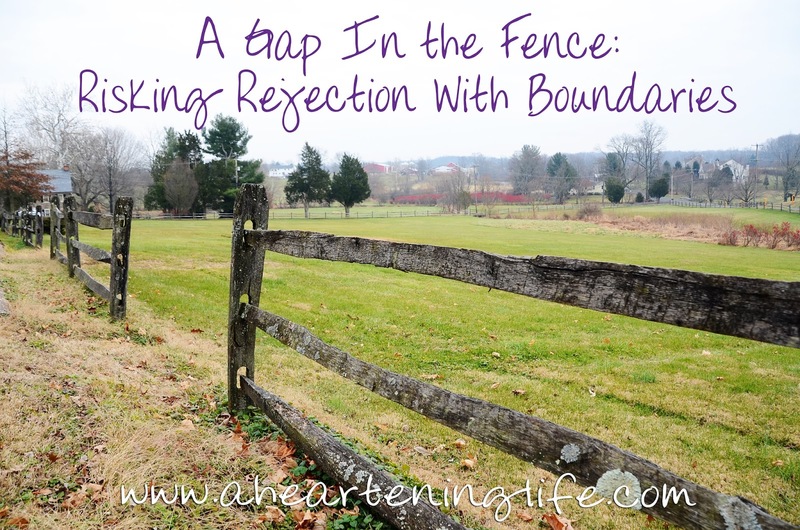 How do you handle it when someone reacts negatively to a boundary you set? Every year my husband cuts back our roses. They look like stumps when he's done with them. Dead stumps with thorns. If he didn't prune the roses back they would still grow and bloom in June. But there is something about chopping them back to stumps that actually encourages growth. It makes me think about people. And suffering. And the harshness of life seasons. The Gardener could just leave us alone. We could grow all gnarly and tangled. Neglected. And we would probably still produce a bud here and there. But He cares for the garden. He prunes and yanks out the weeds. He removes the dead wood. And sometimes He cuts us back to the stump. It may look dim there. We may wonder why he cut off all of our branches. It took us all spring to grow this tall. His care encourages — new growth. So we can produce healthier blooms. As the Gardner waters and fertilizes the "stump" to nurture and feed the flowers, our words and care, especially amid the trials, nurtures and feeds people. Our loving truth and encouragement inspires courage and hope (Merriam-Webster.com). Without it people do not thrive. 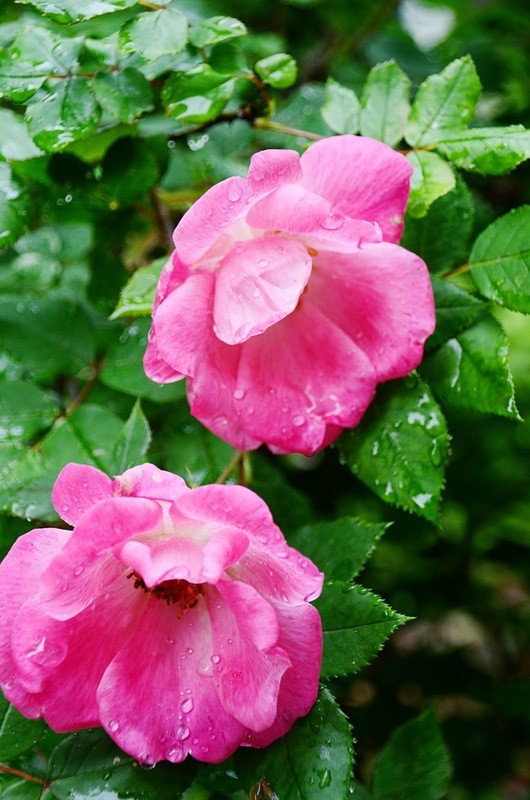 We all need a Gardner to believe in us — to encourage our growth and love us to new life. 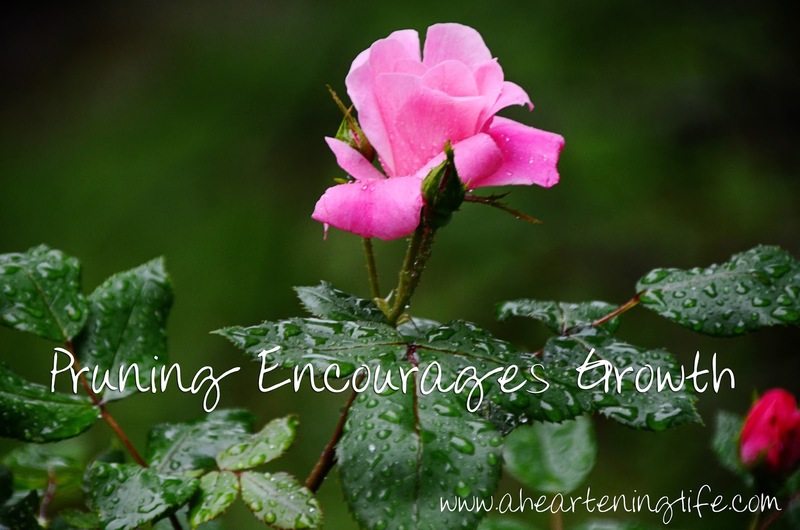 Thankful for the encouragers in my life that give me the courage to grow, heal, and blossom. I don't like people telling me what to do and I like even less being told what I should do. It's a fight in me that puts the people pleaser and the rebel in me at odds. But I've been growing. And noticing. When I feel the urge to cross my arms and stomp my foot in defiance I pause. Because the fight against closes doors. It keeps me locked in a cage with my own thoughts and my own ideas of how things need to be. My heart fights against obey. But there is freedom on the other side — when I oblige, not necessarily because I want to, but because it feels right. 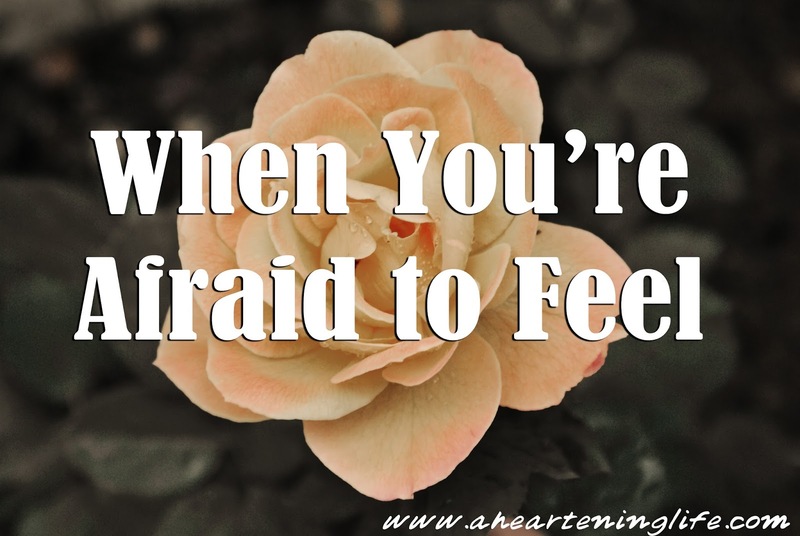 My obedience breaks through my fears and I stop worrying about being right or doing it my way. If there are two sides to every story why can't I give up my side? Giving up can be rewarding, too. Letting go of rebellion and mini-tantrums and stubbornness to allow myself to be open to more. The more I could never see or experience if I remained closed off in a fighting stance. As 2013 ends and a new year begins I have been pondering a new word for 2014. And if it's anything like last year's, I'll have much to learn about this word and how God wants to use it in my life. 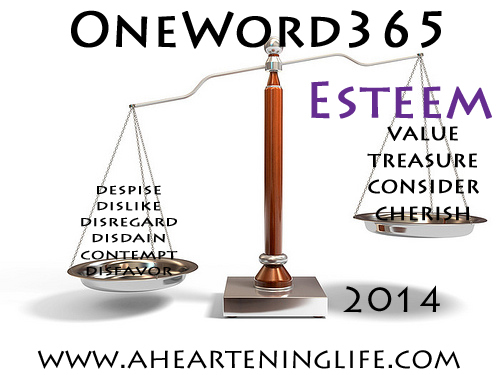 The One Word 365 I have chosen for 2014 is "esteem." 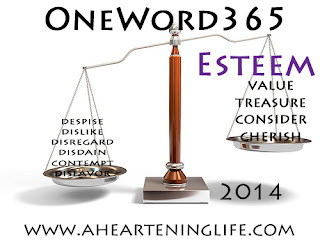 By definition, esteem means to value, treasure, respect, appreciate. But the synonym that really cinched it for me was consider — a word that has recently come up as something I needed to do more of. If you have been reading my blog in the last few months, I have been writing a lot about worth and how I view myself. Yet, I did not choose self-esteem, which would have made the focus entirely on me. I know that ultimately I wish to esteem God and God alone, lest my esteem result in any kind of idolatry. 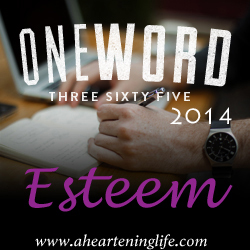 Choosing "esteem" to focus on this year is both a positive and a scary proposition. 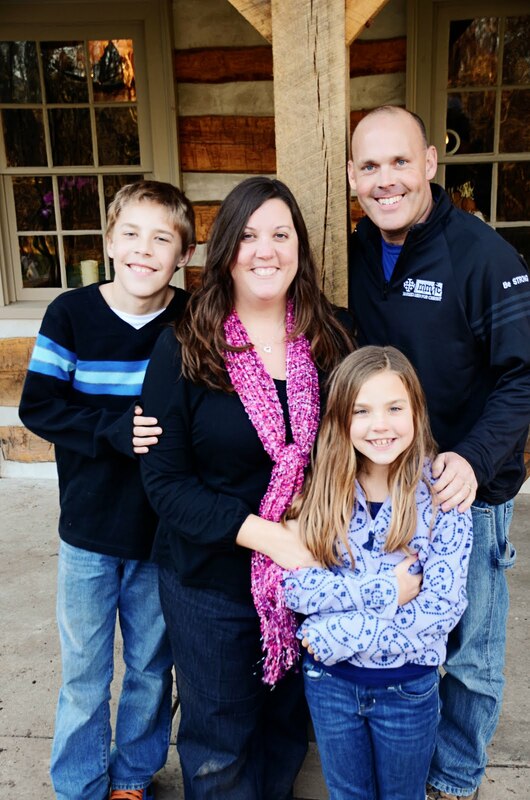 I am open and eager to see what God has in store this year. Have you chosen a word for 2014? Please share in the comments, if you wish. Don't quite understand what all this "one word" stuff is? Check out the One Word 365 website for more info. And I'm linking with Mary DeMuth's #pic4year on her blog. Read more here.